Not to be confused with An Essay Concerning Human Understanding. An Enquiry Concerning Human Understanding is a book by the Scottish empiricist philosopher David Hume, published in English in 1748. It was a revision of an earlier effort, Hume's A Treatise of Human Nature, published anonymously in London in 1739–40. Hume was disappointed with the reception of the Treatise, which "fell dead-born from the press," as he put it, and so tried again to disseminate his more developed ideas to the public by writing a shorter and more polemical work. The end product of his labours was the Enquiry. The Enquiry dispensed with much of the material from the Treatise, in favor of clarifying and emphasizing its most important aspects. For example, Hume's views on personal identity do not appear. However, more vital propositions, such as Hume's argument for the role of habit in a theory of knowledge, are retained. This book has proven highly influential, both in the years that would immediately follow and today. Immanuel Kant points to it as the book which woke him from his self-described "dogmatic slumber." The Enquiry is widely regarded as a classic in modern philosophical literature. The argument of the Enquiry proceeds by a series of incremental steps, separated into chapters which logically succeed one another. 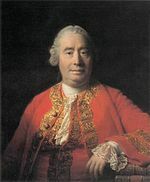 After expounding his epistemology, Hume explains how to apply his principles to specific topics. In the first section of the Enquiry, Hume provides a rough introduction to philosophy as a whole. For Hume, philosophy can be split into two general parts: natural philosophy and the philosophy of human nature (or, as he calls it, "moral philosophy"). The latter investigates both actions and thoughts. He emphasizes in this section, by way of warning, that philosophers with nuanced thoughts will likely be cast aside in favor of those whose conclusions more intuitively match popular opinion. However, he insists, precision helps art and craft of all kinds, including the craft of philosophy. Next, Hume discusses the distinction between impressions and ideas. By "impressions", he means sensations, while by "ideas", he means memories and imaginings. According to Hume, the difference between the two is that ideas are less vivacious than impressions. For example, the idea of the taste of an orange is far inferior to the impression (or sensation) of actually eating one. Writing within the tradition of empiricism, he argues that impressions are the source of all ideas. He shows how a satisfying argument for the validity of experience can be based neither on demonstration (since "it implies no contradiction that the course of nature may change") nor experience (since that would be a circular argument). (Hume 1974:330-332) Here he is describing what would become known as the problem of induction. Here Hume tackles the problem of how liberty may be reconciled with metaphysical necessity (otherwise known as a compatibilist formulation of free will). Hume believes that all disputes on the subject have been merely verbal arguments—that is to say, arguments which are based on a lack of prior agreement on definitions. He first shows that it is clear that most events are deterministic, but human actions are more controversial. However, he thinks that these too occur out of necessity since an outside observer can see the same regularity that he would in a purely physical system. To show the compatibility of necessity and liberty, Hume defines liberty as the ability to act on the basis of one's will e.g. the capacity to will one's actions but not to will one's will. He then shows (quite briefly) how determinism and free will are compatible notions, and have no bad consequences on ethics or moral life. The next topic which Hume strives to give treatment is that of the reliability of human testimony, and of the role that testimony plays a part in epistemology. This was not an idle concern for Hume. Depending on its outcome, the entire treatment would give the epistemologist a degree of certitude in the treatment of miracles. The first section of the last chapter is well organized as an outline of various skeptical arguments. The treatment includes the arguments of atheism, Cartesian skepticism, "light" skepticism, and rationalist critiques of empiricism. Hume shows that even light skepticism leads to crushing doubts about the world which - while they ultimately are philosophically justifiable - may only be combated through the non-philosophical adherence to custom or habit. He ends the section with his own reservations towards Cartesian and Lockean epistemologies. In the second section he returns to the topic of hard skepticism by sharply denouncing it. He concludes the volume by setting out the limits of knowledge once and for all. "When we run over libraries, persuaded of these principles, what havoc must we make? If we take in our hand any volume; of divinity or school metaphysics, for instance; let us ask, Does it contain any abstract reasoning concerning quantity or number? No. Does it contain any experimental reasoning concerning matter of fact and existence? No. Commit it then to the flames: for it can contain nothing but sophistry and illusion." The criteria Hume lists in his examination of the validity of human testimony are roughly upheld in modern social psychology, under the rubric of the communication-persuasion paradigm. Supporting literature includes: the work of social impact theory, which discusses persuasion in part through the number of persons engaging in influence; as well as studies made on the relative influence of communicator credibility in different kinds of persuasion; and examinations of the trustworthiness of the speaker. The "custom" view of learning can in many ways be likened to associationist psychology. This point of view has been subject to severe criticism in the research of the 20th century. Still, testing on the subject has been somewhat divided. Testing on certain animals like cats have concluded that they do not possess any faculty which allow their minds to grasp an insight into cause and effect. However, it has been shown that some animals, like chimpanzees, were able to generate creative plans of action to achieve their goals, and thus would seem to have a causal insight which transcends mere custom. ^ Hume, David (1776), My Own Life, Appendix A of Ernest Campbell Mossner, The Life of David Hume, University of Texas Press, 1954. ^ I. Kant "Prolegomena to Any Future Metaphysics"
^ In Locke's terminology, this was known as the division between simple and complex ideas of sense. ^ Hume, D., Enquiries concerning Human Understanding and concerning the Principles of Morals Reprinted from 1777 edition, Third Edition, L. A. Selby-Bigge (ed. ), Clarendon Press, Oxford, Sect. XII, Part III, p.165. ^ Kohler, Wolfgang. (1925). The mentality of apes. New York: Harcourt. Cited from: Passer, Michael et al. (2003). Psychology: Frontiers and Applications. First Canadian Edition. McGraw-Hill: Toronto. p. 267. This page was last edited on 29 October 2018, at 00:29 (UTC).